Check out information about Fairbanks Ice Museum, its temporary collections, opening hours and location. Visit the Fairbanks Ice Museum to satisfy your appetite for something a little unusual. Housed in the historic Lacey Theatre, the museum has some 20 tons of ice carved into life-sized stereotypical Alaska scenes like bears wrestling salmon, as well as an igloo, an ice chair and bum-numbing ice slide. Fairbanks endures at least seven months of merciless winter. But the residents of this land of snowmobiles and permafrost have discovered the perfect antidote to the city's annual deep freeze. An international contingent of about 110 ice sculptors arrives every March from all over - Russia, Poland, Hungary, Japan, France, Finland, the Czech Republic, Canada, and Mexico, among others, to help breathe life and color into the city's monochromatic, snow-laden landscape. The World Ice Art Championships is the occasion of the largest ice sculpting competition in the world. 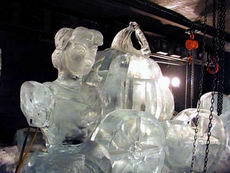 Visitors can watch the evolution of those creations during sculpting competitions held in Fairbanks's Ice Park. During an 11-day period, huge blue cubes of ice stacked in seemingly random order are carved into a variety of figures - a towering centaur, giant spider and web, Mayan pyramid - or into some abstract interpretation of the vortex of life. Photo Ops in Ice Showcase. 20 ft "Ride on Ice Slide"